The boy does not speak. The boy has no name. The boy, raised half-wild in the forests of southern France, sets out alone into the wilderness and the greater world beyond. Without experience of another person aside from his mother, the boy must learn what it is to be human, to exist among people, and to live beyond simple survival. As this wild and naive child attempts to join civilization, he encounters earthquakes and car crashes, ogres and artists, and, eventually, all-encompassing love and an inescapable war. His adventures take him around the world and through history on a mesmerizing journey, rich with unforgettable characters. A hamlet of farmers fears he’s a werewolf, but eventually raise him as one of their own. A circus performer who toured the world as a sideshow introduces the boy to showmanship and sanitation. And a chance encounter with an older woman exposes him to music and the sensuous pleasures of life. The boy becomes a guide whose innocence exposes society’s wonder, brutality, absurdity, and magic. 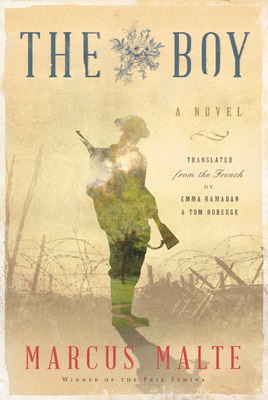 Beginning in 1908 and spanning three decades, The Boy is as an emotionally and historically rich exploration of family, passion, and war from one of France’s most acclaimed and bestselling authors. Marcus Malte was born in 1967 in Seyne-sur-Mer, a small harbor city in the south of France, along the coast of the Mediterranean Sea. As a child, Malte immersed himself in literature, discovering the novels of John Steinbeck, Albert Cohen, Louis-Ferdinand Céline and Jean Giono. He began writing in elementary school and chose to major in film studies after graduating from high school. At twenty-three, Malte became a projectionist in Seyne-sur-Mer’s historical movie theater and soon wrote his first short stories. Later in the 1990s he began reaching broader audience with a series of novels, a couple of hard-boiled detective stories where Malte created the recurrent character of Mister, a jazz pianist. Marcus Malte’s fiction includes Garden of Love his first real success (rewarded with a dozen literary prizes, including the Grand Prix of the readers of Elle, police category, 2007) Les Harmoniques (Prix Mystère de la Critique, 2012) and more recently Le Garçon (The Boy) for which he received the famous Femina Literary Prize (2016). The Boy is his first novel to be translated into English. Tom Roberge is co-owner of Riffraff bookstore and bar in Providence, Rhode Island. He learned French as a Peace Corps volunteer in Madagascar and was formerly the Deputy Director of Albertine Books, a French language bookstore in New York. “You’ll go from laughter to tears in this masterful account of the discovery of the world’s trials." “Without ever speaking but with charisma and genuineness, the boy inevitably touches everyone he meets. Including the reader."